Becoming a freelance writer is more detailed than what most people may think. It isn't as easy as opening up your Microsoft Word software and just typing. To be a successful freelance writer, there are certain prep steps that must be done. Anyone can write, but to be successful, you must know and follow the preliminary steps. Passion in Writing: The first step in becoming a freelance writer is having passion. One must love to write. Writing is like any profession, in that you must be ready to do it for a while. Sometimes there will be times that you don’t like what you are writing about, but you still get a thrill when the project is complete, and you have a wonderful finished product. A freelance writer should also enjoy researching and learning. There will often be times that you are given a project that you know nothing about. This means you will have to dedicate time to research the topic, then write a unique piece on that topic. Following through on this process day in and day out for 20, 30 or even 40 years means you'll need a reserve of passion and interest to get you through. Writing is a passion that is felt deep down, and not everyone has it. Be Open: A writer has to be open to all topics. There are times when a writer may be asked to write about a topic that they don’t support. The writer must be open and just keep their personal views to themselves and write about the topic given. If you are offended about a topic, you may consider politely declining the work. But, as a new freelance writer, keep in mind that you may have to take jobs that you don’t like or agree with. 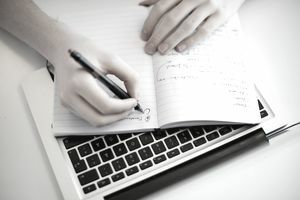 You have to get started somewhere and the first few months of freelance writing may mean writing on all kinds of odd or different topics while you're building up your portfolio and clips. Great Profile: A freelance writer that is just starting out should have a great profile. Create a profile and display your writing accomplishments online using a website, a portfolio site or a bid site such as Elance or Odesk. If you have written any articles that were published, include these in your samples, along with any books, materials, online articles, or experiences from full-time jobs or volunteer opportunities. References should also be added so the client can see what you have to offer and hear about your strengths from past colleagues. Website: Create a website that features your samples and clips. It will give potential clients a chance to see your work. Consider composing and posting to a blog daily. It will keep your content fresh, bring readers to your website and give you practice composing on a tight schedule. Seek Work: Start looking everywhere for work. Seeking out new clients is vital to building your freelance writing business. Start off by offering your writing at an affordable price. Grabbing clients in this manner will give you a chance to prove yourself and capture the client for the long haul. The client will see that your writing is excellent and seek you out for other/upcoming/future work. This is how you will build your business. Another wonderful thing is that satisfied clients will tell others about your writing, which provides free advertising for you, leading to additional work. Be Patient: Have patience. When a freelance writer is just starting out on their own, it can take a while to land that first job. Many freelancers get into the business as moonlighters or part-timers as they build up their portfolio and expertise. If you have true ambition for this work, building a thriving freelance business can be accomplished. The first step is having the passion and dedication that leads to "doing," as opposed to dreaming, talking, or planning. After that, patience and commitment come into play, as it takes time to build a clientele. Putting in the work and keeping the long arc of the future in mind will get you there eventually if you stick with it. Now, go write.